Stevie Nicks’ 24 Karat Gold tour began its next leg in February and is continuing to distinguish itself as one of the most unique (and popular) arena tours in recent memory. A lot of that has to do with the skillful storytelling ability of Nicks. As I wrote after seeing this show last December at the Forum in Los Angeles, the anecdotal tales that set up the many deep cuts in the show give Nicks an opportunity to share little-known stories that give the songs deep color and context. Comfortable and compelling as she takes the audience along on her journey, the arena environment at once becomes intimate. The stories are funny and poignant and inspirational. Blending obscure nuggets (including the marvelous “Crying in the Night” from the Buckingham Nicks album) with emotionally charged classics like “Stand Back” and “Gypsy,” this show presses many emotional buttons, and Nick’s personal, girlish charms as the evening’s main draw create many memorable moments. But at the recent San Diego show I witnessed, just like in December, what sets the performance up is a breathtaking opening set by the Pretenders, of course featuring, Chrissie Hynde. Still scrappy, tough and post punk glamorous, Hynde is an important counterpoint to Nicks. Her muscular, no-nonsense attitude still resonates just like it did in 1980 when much of the world became aware of her. Sure she has softened a bit, but not that much. And many of the songs still pack the same sneer and snarl that they did more than 30 years ago, thanks to Hynde’s authenticity and street smart purity. 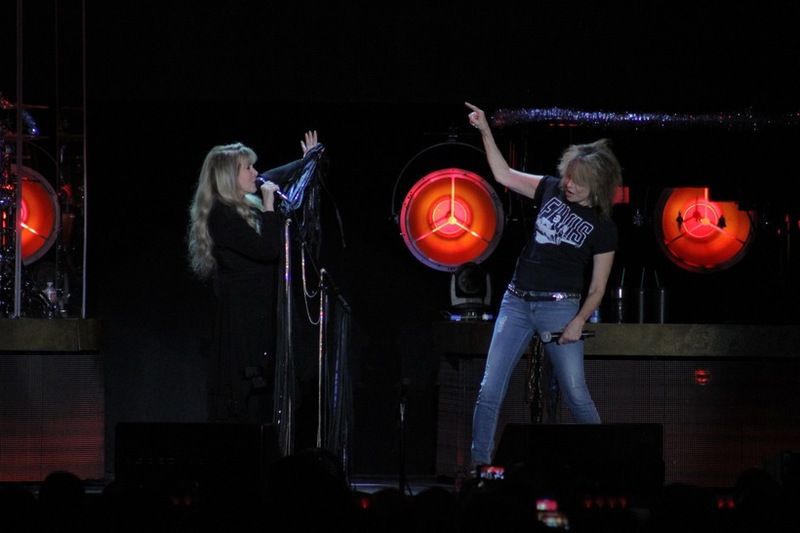 One of the evening’s most remarkable moments is when Chrissie joins Stevie to duet on the Nicks/Petty standard, “Stop Draggin’ My Heart Around.” In that moment, the magic of this tour is crystallized. In and industry dominated by male front men and supporting superstars, how refreshing it is to see two women at center stage, as captivating and appealing as any of their male counterparts. In their own different ways, these two women have done as much for music as any others in history. Though stylistically different, both have remained true to themselves and their music. Both have trail blazed paths. Both of them represent the sort of integrity in the business that you rarely see anymore. They are both more than just legends. They are pioneers.